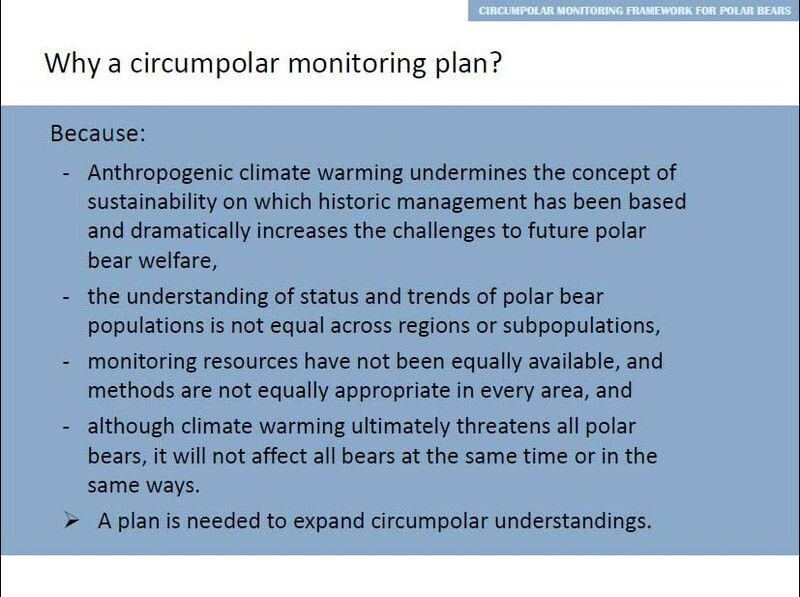 This “framework” plan was referred to extensively at the recent International Polar Bear Forum (aka the “Meeting of the Parties” that signed the 1973 conservation treaty) held in Moscow, December 3-6, 2013 (see posts about the meeting here, here, and here). In fact, government representatives of all Arctic nations present at that meeting agreed in principle to support the proposed plan. 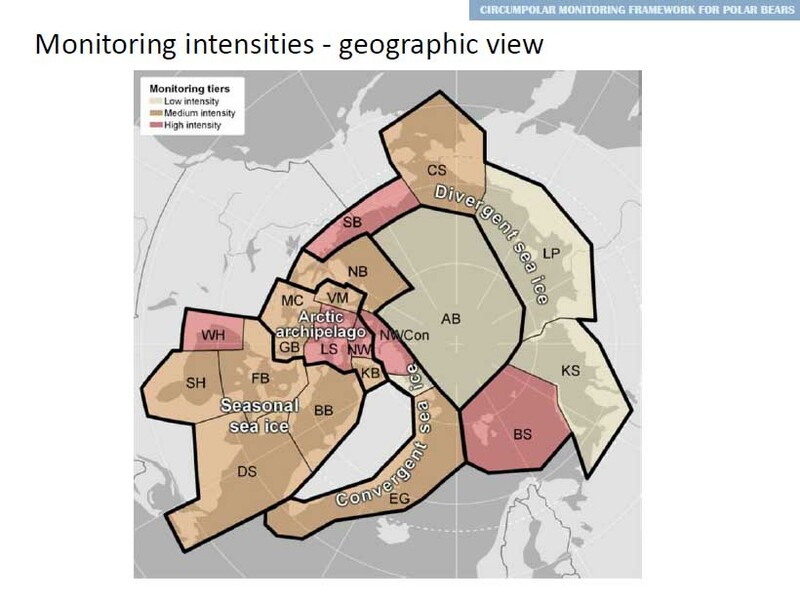 No media reports that I’ve come across after the Moscow polar bear meeting explained what the “monitoring framework” involved, so I’ve composed a brief summary and commentary, aided by some images from Dag Vongraven’s presentation in Moscow (Vongraven 2013; pdf here). In short, Arctic government representatives at the Moscow forum agreed that all future polar bear research should be constrained by the premise that increases in global temperatures over the next century will occur exactly as predicted by climate models and will negatively affect polar bears precisely as predicted by models devised by polar bear biologists. Under the plan, subpopulations that are already showing predicted effects of global warming will get the bulk of research funds, while regions that are paradoxically not responding as predicted will get much less money for research and survey efforts. This strategy proposes a coordinated research plan that is blatantly agenda-driven: implementing it would seriously compromise the usefulness of all research results generated for decades to come. I don’t think it’s anything close to being a scientifically valid plan, but decide for yourself. Figure 1. Vongraven 2013, Title slide. OK, but what does the proposed plan entail and what are the problems? Computer modeled predictions of global temperature increases over the next century, in other words, are accepted as an inevitable reality, as are the impacts that these changes are predicted to have on Arctic sea ice. Figure 2. Vongraven 2013, Slide 2. 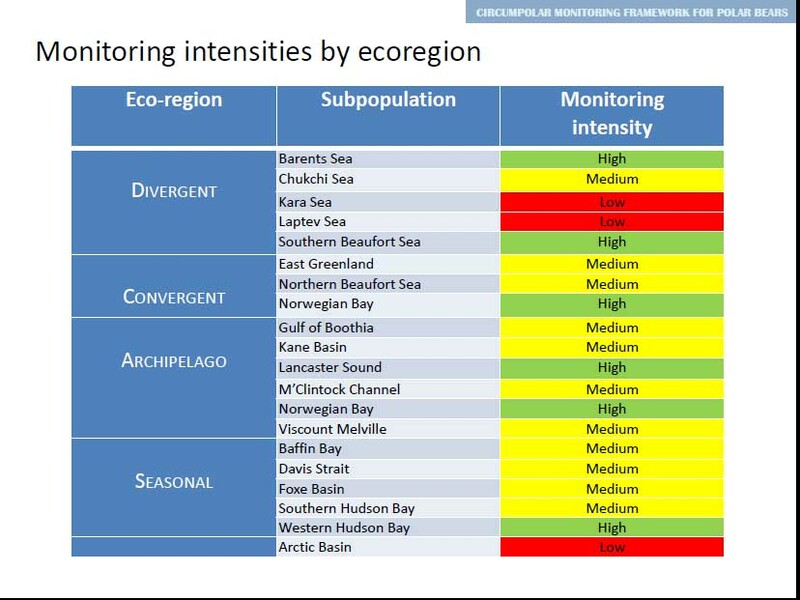 However, the acceptance of predicted global warming as an inevitable realty isn’t the worst of the plan’s problems: the monitoring plan’s practical foundation involves the dubious concept of “sea ice ecoregions” (Fig. 3), defined by Amstrup et al. (2008) and discussed in a previous post here. Sea ice in each of the four defined ice ecoregions (Fig. 3) is expected to respond similarly to predicted increases in global temperature over the next century, and by extension, the polar bear populations within them are predicted to respond similarly to changing ice conditions. 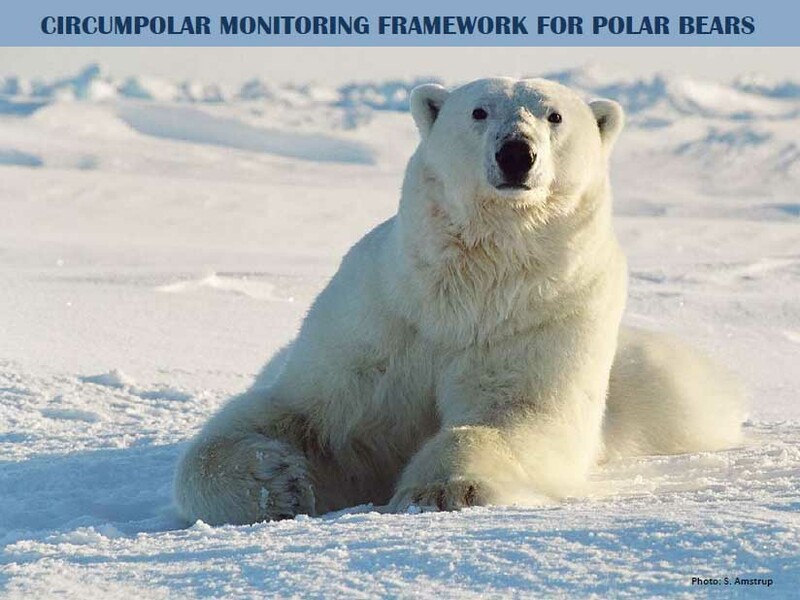 The “monitoring framework” plan uses this system of classification as a rationale for treating all subpopulations within a given sea ice ecoregion as equivalent entities for research purposes: research results from one polar bear subpopulation within a particular sea ice ecoregion becomes a proxy for all other subpopulations within that region. However, recent research has shown this premise is false. For example, the Chukchi Sea and the Southern Beaufort are both considered “Divergent ice” ecoregions but polar bear populations within these two regions have not responded in a similar manner to recent sea ice declines, as I’ve discussed previously (here; see also Rode et al. 2013a,b). However, the “framework” plan for the “Divergent ice” ecoregion will focus high quality (“high intensity”) research and population survey efforts (Fig. 4) on the Southern Beaufort and Barents Sea only, allowing researchers to ignore or downplay contradictory evidence from the Chukchi Sea (Figs. 5-6). 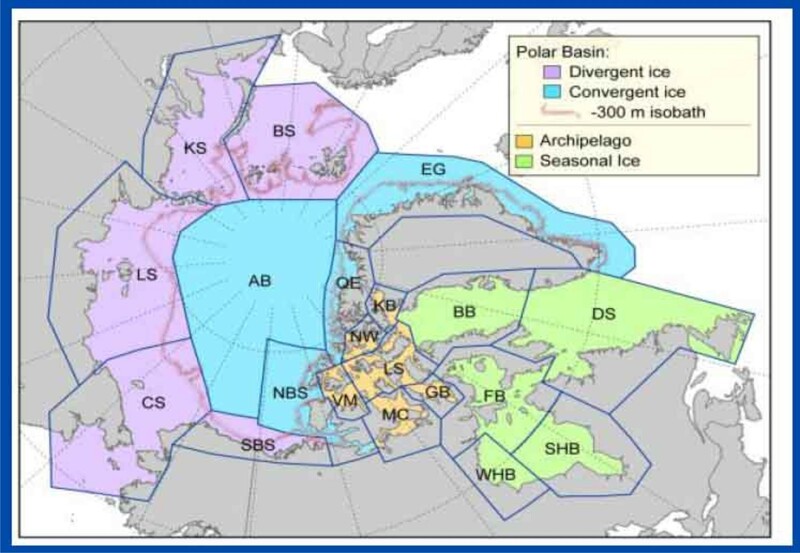 Similarly, Western Hudson Bay, Southern Hudson Bay, Foxe Basin and Davis Strait are all classified as “Seasonal ice” regions (Fig. 3) but polar bear populations within these four regions have not responded in a equivalent manner to recent increases in the ice-free season (i.e., early breakup and/or later freeze-up, see previous summary post here). While the subpopulation in Western Hudson Bay has shown a small decline in population size and other undocumented changes (almost all of the most recent data for WHB has not been published), paradoxically, under virtually the same sea ice conditions, the Southern Hudson Bay subpopulation has been stable, the Foxe Basin subpopulation has been stable (Stapleton et al. 2012), and the Davis Strait subpopulation has increased (see previous post here and here). However, the “framework” plan for the “seasonal ice” ecoregion will focus all high quality (“high intensity”) research and population survey efforts (Fig. 4) on Western Hudson Bay only, allowing researchers to ignore or downplay contradictory evidence from Southern Hudson Bay, Foxe Basin, and Davis Strait (Figs. 5-6). Figure 4. Vongraven 2013, Slide 11. “High intensity” regions (green bars) will get the most research funds and survey effort. “Medium intensity” regions would get substantially less research attention, see Fig. 6. Figure 5. Vongraven 2013, Slide 12. 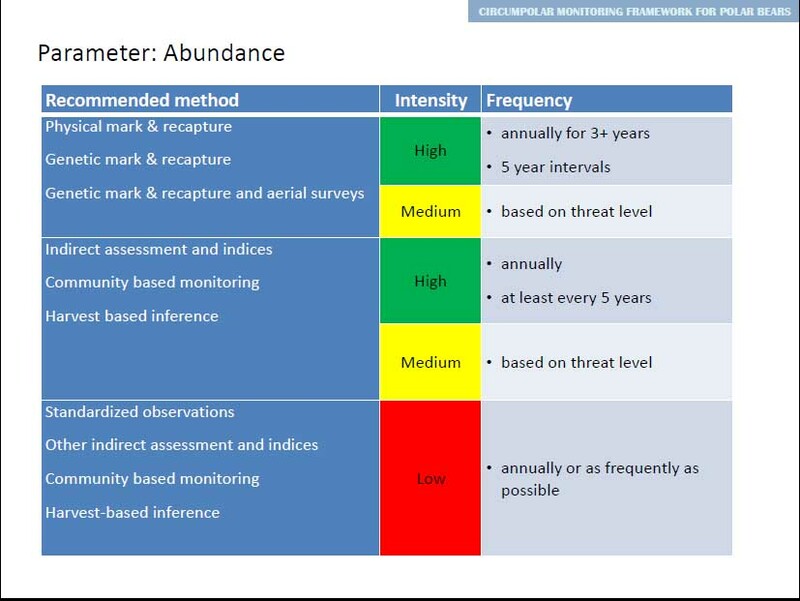 Planned “monitoring intensity” regions mapped out. In this plan, the grouping of the Lancaster Sound (LS) and Norwegian Bay (NW) subpopulation regions with the new region designated “Norwegian Bay Convergent” (NWCon) suggests this Central Arctic cluster may become a new amalgamated subpopulation, see previous post on the upcoming changes to polar bear subpopulation boundaries by the by the IUCN Polar Bear Specialist Group. Figure 6. Vongraven 2013, Slide 14. Polar bear biologists worldwide form a small pool of researchers competing for limited funding resources. If good quality research and survey effort is directed only towards subpopulations that are already showing some of the expected effects of global warming, how will we know if the other subpopulations continue to show contradictory effects? We won’t, because the peer-reviewable research simply won’t get done — the relevant data won’t be collected. The vote on formal acceptance of this plan will not take place until 20151. So there is still hope that representatives of Arctic nations will reject it, or insist on major amendments, or find ways to delay or avoid implementing the plan. In my opinion, our understanding of natural polar bear biology and population ecology is already severely skewed by the fact that populations have only recently recovered from decades of wanton slaughter. Now is not the time to abandon unbiased scientific research — there is so much we don’t know about polar bears. Unfortunately, this research plan is so blatantly agenda-driven that implementing it would skew data collection and research results for decades to come. What a travesty for science that would be. Rode, K.D., Douglas, D., Durner, G., Derocher, A.E., Thiemann, G.W., and Budge, S. 2013a. Variation in the response of an Arctic top predator experiencing habitat loss: feeding and reproductive ecology of two polar bear populations. Oral presentation by Karyn Rode, 28th Lowell Wakefield Fisheries Symposium, March 26-29. Anchorage, AK. Abstract below, pdf here. Stapleton, S., Peacock, E., and Garshelis, D. 2012. Foxe Basin polar bear aerial survey. Nunavut Wildlife Research Trust, Government of Nunavut, Igloolik. Pdf here. This entry was posted in Conservation Status, Sea ice habitat and tagged Amstrup, Chukchi Sea, Circumpolar monitoring framework, contradictory evidence, Dag Vongraven, Davis Strait, Foxe Basin, Harris, PBSG, Polar Bear Specialist Group, population estimates, sea ice ecoregions, Southern Hudson Bay, Ursus journal, Vladimir Kattsov, western hudson bay. Bookmark the permalink.